We hope this FAQ (Frequently Asked Questions) section of our website will answer your question or questions that you might have about our library. If you have a question that you feel needs to be included in this section, please provide it to one of our librarians. Does it cost anything for me to get a library card? Getting a library card for our library is free of charge. We don’t hand out plastic cards, but we will put you in our system, and give you a patron number. We encourage you to remember your patron number. Do I need any proof of ID or residence to get a library card? You don’t need to prove you live in the area, we’ll take your word for it. As long as you live locally – even as far away as Canton – you can join our library. If you live farther away, but visit Fairview regularly, talk to staff about whether or not you may still be eligible to join. I can’t make it in to town to renew my stuff, but I don’t want to get stuck with late fees. What do I do? You can call and renew your items over the phone up to three times. We also have a drop box for after-hours returns. If you turn off 7th Street, between Broadway and Central, and drive through the alley between the City Building and the Community Center, you can reach right out the window and use our book drop. It’s flush with the wall. Please do not leave DVDs or magazines in the book drop, though, because they get torn up very easily. When you first join the library, you can check out two items. When you bring back items on time and in good shape, the amount you can check out goes up. Eventually, you may be able to check out up to 10 items at a time. I’m not much of a reader, but I really like to read magazines. Do you check out your magazines? We sure do! Our magazines check out for two weeks, just like all our other items available for checkout. I’d really like to get a movie to watch this weekend, but I can’t afford the movie rental place. Do you guys have movies on DVD? Absolutely! Our DVDs and VHS tapes check out for two weeks, just like all our other items available for checkout. However, our movies are $1.00/day overdue, so make sure you bring them back on time! And please don’t leave them in the drop box, they get broken that way. I lost the books I checked out and now you won’t let me use the computers. Why? The Library reserves the right to deny access to computers or items to those who have violated our rules by failing to return items, failing to pay fines, returning items in damaged condition, or failing to make reparations for damaged items. If you really need to use the computers, please come in and talk to us about what happened to the items you checked out. Most of the time we are glad to work with people, if they come in and let us know what is going on. I’m scared to bring my stuff back because I know the fines will be really huge and I can’t pay that right now. What should I do? Bring your stuff in and let us know you’re having a hard time financially right now. As long as your stuff isn’t damaged, we can work with you on paying the fines off. Sometimes we can even let you ‘work’ it off by volunteering around the library, or by donating homemade baked goods to our book sale. Do I need to be a library member to use your computers? You don’t need to be a member of our library to be able to use our computers. We will put you down as a visitor the first time you come in. If you come in regularly, we will add you as a member of the library. There is still a fee if you print something, but otherwise using our computers is free. However, the Library reserves the right to deny access to computers or items to those who have violated our rules by failing to return items, failing to pay fines, returning items in damaged condition, or failing to make reparations for damaged items. Yes, we have WiFi. Our WiFi is freely available, so there is no charge to use our WiFi, and it is always on, whether or not we are open. Look for the name ‘FREE_LIBRARY_WIFI’. You do have to be on the library grounds to receive our WiFi connection, though. Is there a fee to use your wifi or your computers? No, there is no fee to use our WiFi, or our computers. You don’t need to be a member of our library to be able to use our computers. We will put you down as a visitor the first time you come in. If you come in regularly, we will add you as a member of the library. There is still a fee if you print something, but otherwise using our computers is free. However, the Library reserves the right to deny access to computers or items to those who have violated our rules by failing to return items, failing to pay fines, returning items in damaged condition, or failing to make reparations for damaged items. There is a fee associated with printing, and you can only print from our computers. Is there a password to use your WiFi or your computers? Our WiFi is always on, and there is no password needed to access it. Look for the name ‘FREE_LIBRARY_WIFI’. You will need to stay on library grounds to use it. Anyone is welcome to come in to the library at any time during business hours and use our computers. However, the Library reserves the right to deny access to computers or items to those who have violated our rules by failing to return items, failing to pay fines, returning items in damaged condition, or failing to make reparations for damaged items. My uncle just wants to apply for a job, but they won’t give him a paper application. They keep telling him he needs to apply online, but he doesn’t even have an email address. I don’t have time to show him how to do that. Can you help him? Sure, we can help him. If he can arrange an appointment for when he has at least 30-45 minutes, we can set him up with an email address and show him a little about how to use a computer. If he wants to fill out a job application online, he needs to arrange an appointment for when he has at least 45 minutes or so for each application. If he needs help using the computer, we can help him with that, too. My computer at home always remembers my email passwords. Why won’t your computer do that? Our computers are set up to not remember your passwords for your safety. 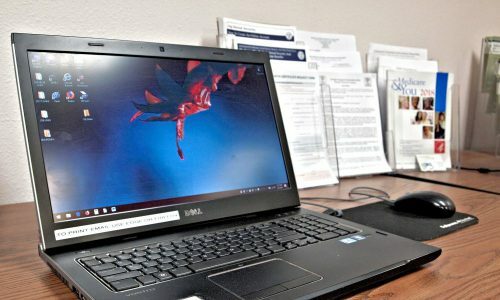 Our computers are public use, and that means that anyone can come in off the street and use them. Not remembering passwords helps keep your private information private. You helped me set up an email address, but you won’t tell me my password. Why won’t you help me? We would love to help you. But due to privacy concerns, we are not allowed to keep information like your email passwords. We are happy to help you set up an email address, and show you how to use it. But keeping track of private information like your passwords is your responsibility. I am a member of the Library, and since I got a Kindle for my birthday, I’ve really gotten into eBooks. I really wish your library had ebooks I could check out! Great news – we do! We belong to a consortium of many smaller Oklahoma libraries pooling their resources to provide eBook options for their patrons through the ‘OK Virtual Library’. We have already helped several local school districts sign their students up for eBooks, and we would love to help you, too! Just come in and ask staff about getting signed up for our ‘OK Virtual Library’. There is no fee for this service, and since books return themselves automatically, there aren’t any fines, either! I heard about something called ‘OK Virtual Library’, and since I got my Kindle, I’d like to try it out, but I’m not a member of your library, and I don’t even live in Fairview. What can I do? Just come on in and ask staff about getting signed up for OK Virtual Library! We have already helped several local school districts sign their students up for eBooks, and we would love to help you, too! There is no fee for this service, and since books return themselves automatically, there aren’t any fines, either! I really like to listen to audio-books while I’m commuting. Do you have any? As a matter of fact, we do! We have a good selection of audio-books on CD, as well as audio-books available through our OK Virtual Library eBook program. Come on in and ask staff about it! Can I print something from my phone? Thanks to an Edge Technology Grant, we now have a wireless printer. It is only available during our normal business hours, and you will need to ask Staff before attempting to print. Normal printing fees apply.. Yes; if the company or person you are sending documents to will accept scanned documents via email, scanning can be a cheaper alternative to faxing. If you have a thumb drive, or even if you want to email your documents, we can scan documents. Our scanner creates a PDF or a JPEG out of your file. Our fees for scanning are: 1-50 pages, $1.00; 51 pages or more, $5.00. Just ask staff for help when you come in. Can you fax something for me? Can I receive a fax here? How much is it? Yes, we can send and receive faxes for you. To send a fax it costs $3.00 for the first page you send, and .50¢ for every page you send after that. To receive a fax it costs .50¢ a page. Fees are due at the time you send or receive the fax, and we ask that you call ahead of time when you would like us to receive a fax for you. Do you accept debit cards or credit cards? Yes, we accept debit cards or credit cards, but we are required to charge a $1.00 fee for every transaction. Cash is recommended. I’ve been researching my family genealogy, and I’ve found out I have relatives in Fairview. I’d like to look through your obituaries and your microfilm, but I live out of state. What can I do? Staff would be happy to help you with minor genealogy research requests, as time permits. If you are visiting, please call ahead and let us know what you would like to do, so we can make sure there will be someone here to help you. We can also do limited genealogy research or obituary copies as time permits, and email scanned copies of articles or obituaries for you. All we need is a name and date of death for obituaries, or the month, year, and title of the article you are looking for.